Dilworth Paxson Chairman and CEO Ajay Raju receiving the “Learned Hand Award” from AJC Philadelphia/Southern New Jersey President David Smith at a ceremony in Philadelphia on January 31, 2019. The lawyer, philanthropist and venture capitalist recognized for professional and civic leadership. 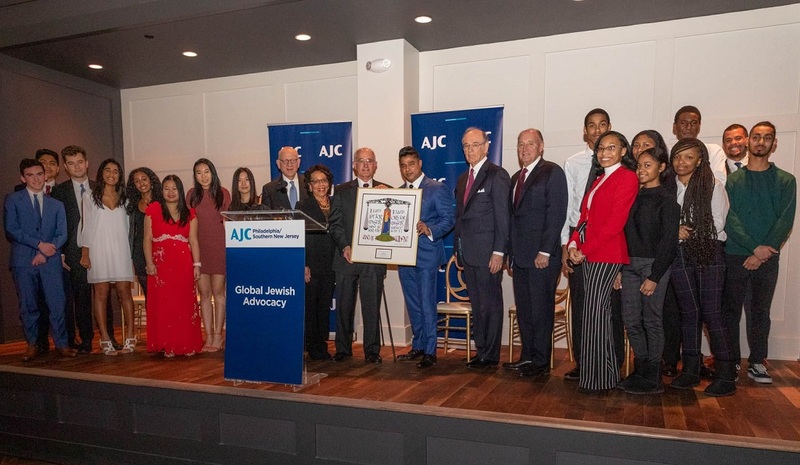 AJC Philadelphia/Southern New Jersey on January 31st honored philanthropist, venture capitalist and law firm chair Ajay Raju with its annual Learned Hand Award at a ceremony in downtown Philadelphia. Named for the legendary 20th century American jurist and legal philosopher, the Learned Hand Award recognizes members of Philadelphia’s legal community who have distinguished themselves through professional and civic leadership. Raju, who serves as Chairman and CEO of white shoe Philadelphia law firm Dilworth Paxson LLP, joins a who’s who of prior Learned Hand honorees. An outsized figure in the region’s legal and business worlds for the better part of two decades, Raju is widely recognized as a pioneer in reimagining the role, capabilities and fate of the legal industry in the 21st century. Not only one of the sole Indian-Americans to head a major law firm, Raju was among the first legal leaders to standardize alternative fee models and process mapping strategies for legal work. As a committed gadfly, he has spent much of his career aggressively challenging conventional notions of what a law firm can be, leading by example with the launch of a venture fund, a real estate investment enterprise and a start-up incubator, each operating in concert with the traditional legal services upon which Dilworth Paxson built its august reputation. In recent years, Raju has trained his contrarian outlook on the future of the Philadelphia region. Through the philanthropic foundation he started with his wife Pamela, he has deployed a host of civic endeavors, including a leadership proving ground for elite Philadelphia high school from across socio-economic backgrounds, a transnational arts and culture exchange, and a web-based outlet for solutions-based journalism and activism. And as an unofficial ambassador for his city’s robust medical research sector, Raju writes and advocates extensively on the prospects and imperative for Philadelphia to become a global nexus for groundbreaking innovations in medical technologies and therapies. At the AJC ceremony, Raju maintained his longstanding practice of demurring from award acceptance speeches, instead leaving it to his young Dilworth colleague Christopher Nana-Sinkam to speak on his behalf. As Raju looked on, Nana-Sinkam paid tribute to the “impact of the great legal minds who influence Ajay,” and the “boundless energy and creativity of the high school fellows of The Germination Project and the Ten.” Nana-Sinkam emphasized that neither the accomplishments for which Raju was being recognized nor the ambitious goals he envisions for the region could be achieved by any one person, but only through dedicated collaboration among and across communities.